Ahmed Mohamed tweeted out yesterday’s Dallas Morning News headline, confirming a report that the family accepted an invitation to visit Qatar, sponsored by the Qatar Foundation for Education. “The last few weeks have been truly life-changing for my son Ahmed and for our family,” patriarch Mohamed Elhassan Mohamed said in a prepared statement announcing the trip. The family says that the Qatar Foundation for Education, Science and Community Development, which gives to educational causes, invited them. Their sister institution the Qatar Foundation International (QFI) recently granted the Arabic Immersion Magnet School in the Houston Independent School District $75,000, according to the district’s board of education, Breitbart Texas reported. QFI was founded by Al Jazeera creator Sheikh bin Al Thani and is closely associated with the Muslim Brotherhood. In 2011, QFI partnered with the U.S. Department of Education’s Connect All Schools consortium “to connect every school in the U.S. with the world by 2016” digitally, which President Obama unveiled in a historic 2009 speech in Cairo. The foundation “offered the boy a tour of Education City, a 5-square-mile cluster of universities and think tanks in the Qatari capital, Doha” according to the Dallas newspaper, which indicated that Mohamed’s relatives in Texas anticipate the family’s mid-October return. Breitbart Texas reported that Ahmed’s father recently said he wanted to take the boy on a pilgrimage to Mecca, the Muslim holy city in Saudi Arabia. 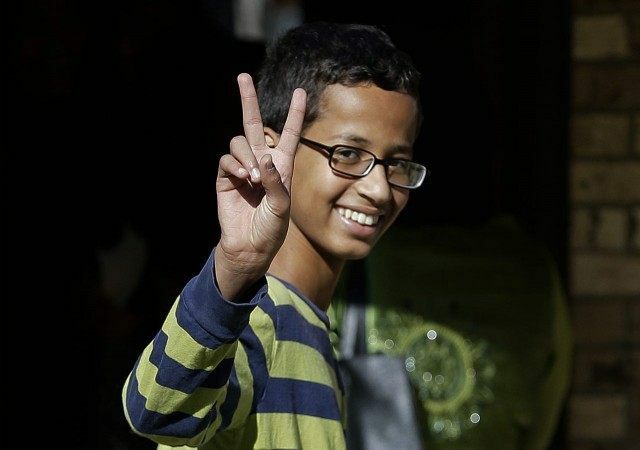 After the Qatari safari, the Mohamed family claims they will finally retrieve the clock that Irving police repeatedly asked the family to pick up more than a week ago. Uncle Aldean Mohamed said the boy needs his clock-in-a-box “to take to the President” who tweeted Ahmed a White House invitation.